Do you ever have the sudden urge to pick up random educational texts and start reading them? This morning, I had that urge when I decided to walk down memory lane by opening up one of my college textbooks called, Curriculum Leadership by Allan Glatthorn. As I was flipping through the text, I ran across a chapter in the book discussing ways that we can meet the needs of our learners by giving them opportunities to practice thinking critically. I do not think that this is to anyone’s surprise that critical thinking is trending upwards. Getting students to share their thinking rather than simply sharing an answer is no longer a should but a must in the classroom. As teachers, we should strive to provide our students with learning opportunities that are not only engaging but are purposeful with the content that we are teaching. One of the best ways that we can be purposeful with our content is to give students opportunities to share background knowledge and firsthand experiences. Should thinking skills be general processes or content-specific? Which skills are the most important for your classroom? How do you currently teach them? Which skills are the least important? Reflecting on the strategies above, it will be important to plan out times throughout your day/week that gives students the opportunity to practice these strategies. The important question to consider is, how do you plan to do this? Looking for some amazing resources to help bring choice into your classroom? Look no further! The above link is a small collection of some of my favorite resources that are perfect for the student-centered classroom! Included are resources from some of my favorite choice pioneers like Kasey Bell and the Hyperdoc Girls. Also included are Caitlin Tucker , Tommy Spall, and Alice Keeler. Giving students choice in the way they present their learning can be scary to think about, but try not to panic! Choice allows us to create learning opportunities for our students that are truly unique. It also allows for students to let their creativity shine! Have you ever used Google Drawings? It is such an underrated tool! Like one of the best tools that you can use with Google! Staff Newsletter I use drawings like its a cork board in the staff lounge. A creative twist on the regular newsletter. Google drawings is perfect for getting students to make a collage of things that represent them. A cool activity that you could do to start the year. Interactive Map – Use drawing to create interactive maps. You can annotate the map and add hyperlinks to make it really come to life. Here is an example that I used with 9th graders with the Odyssey. Making Graphics – For my blog, I used drawings to make my header. I can easily bring in images to the canvas and quickly download them. Best part, they are always in my drive. Graphic Organizers- Sometimes google docs and other apps can get in the way of my thinking. Google drawing makes it easy to quickly create text boxes and other objects and move them with ease. Here is an example I used with a third grade class to frayer a character from the book, The One and Only Ivan. Are you looking for ways to increase student voice in your classroom? According to the research of Barbara Bray and Kathleen McClaskey’s, the framework for a Personalized Learning Environment (PLE) is perfect for designing activities that give students a voice. Check out the Google Doc below for activities that can easily be implemented into your Hyperdoc. Make a copy of the table then place it in your current hyperdoc. Pick one task from each column. That way you’ll give your students three different ways to share their voice by explaining, collaborating, and sharing. Replace the other tasks links with specific directions for your students. You are all set! Make those voices shine! If you would like to give your students some choice in their voice, leave a few options under each column for them to choose from! 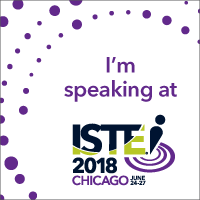 OKAY…so ISTE was awesome and I wanted to share some ideas that I learned while I was there. My fingers started to hurt, so I kept it to ten, but trust me, there is much more! First of all the conference is HUGE. There are seriously thousands of educators from all over the world. #2 Twitter makes ISTE so much better! f the great things happening around the conference! On top of that, I was able to meet some really awesome people I follow on twitter like: Matt Miller, Marlena Hebern, Jarod Bormann, and the Liv Bits! By the looks of all the booths at the Expo hall. It seemed like 80% of all the booths had to do with coding, robotics, and STEM. It felt like a toy store with all the fun that was at my fingertips. 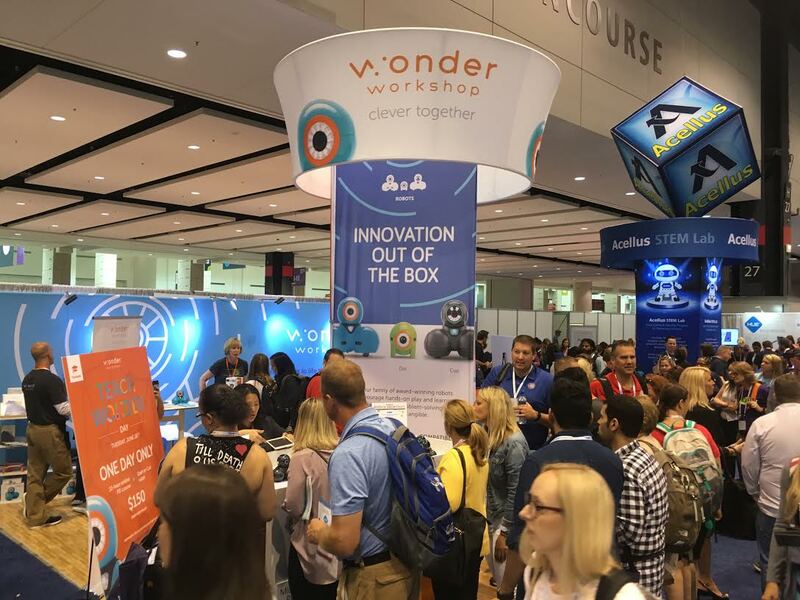 If your school is considering makerspace, make a trip to ISTE. Are you team Google or Microsoft? What’s your go-to LMS? Does everyone even know what that means yet? Whether you’re a beginner Googler or Expert Flipgrid-er , there are sessions for everything and anything. Don’t assume that everyone is already doing something or knows about something. If you’re in a 1 to 1 district, don’t take it for granted. Also, be on the lookout for new Google Classroom updates coming in the early fall! #6 Our students can do AMAZING things! I am a sucker for all the student presentations that were around the conference. IGNITE talks, poster sessions, demos, etc. were wonderful. It just shows what students are capable of when they are given opportunities to shine! I have to admit, I can be somewhat of a scaredy cat when it comes to going outside my comfort zone. Getting out there and talking to educators at booths and around the conference taught me a valuable lesson in the importance of sharing your story. One of my favorite stories was told by one of the exhibitors from Purple Mash (a coding site). I met an English man named, Anthony and we chatted about American and English Football. It was crazy how big of opposites we were. He really loved American football and I really love English football (Go Liverpool!). It turns out he played for the Bristol City Rovers, how cool! Something I won’t forget! 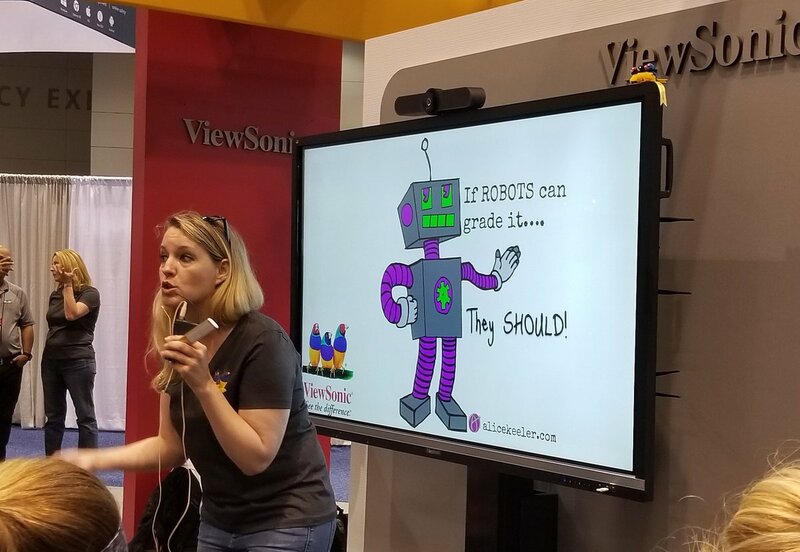 During ISTE, I had the privilege of meeting, Vicky Davis, the Cool Cat Teacher. I was lucky enough to be invited to take part in her 10-minute podcast. I admittingly told her that I was afraid to share with her because I felt like my ideas were too small and my ideas weren’t important enough for somebody who has over 150K followers. She smiled, looked me in the eyes and said, “Brett, we’re all educators here, every teacher’s opinion matters.” So this is why I am here, doing this right now. Share your ideas. Share your passion, do not keep it to yourself. “No one who ever bought a drill wanted a drill. They wanted a hole.” – Perry Marshall. It’s not all about technology. 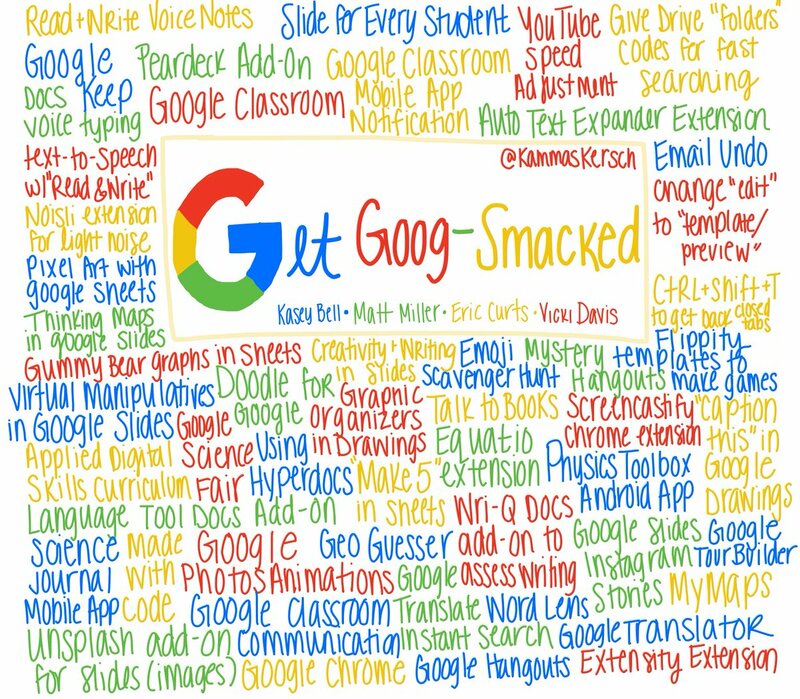 Students don’t want Chromebooks to do the same kinds of activities they could complete with pencil and paper. They want to use tech to share their ideas and voice. When using technology, focus on the purpose. Don’t forget to give your students some CHOICE as well. A great Rule of Thumb is: if Google Can answer or do it for you, it’s too easy. Use technology to redefine learning to something that wouldn’t be possible without it! Make learning AWESOME! Do YOU use Hyperdocs in your classroom? In 2016, I was introduced to Hyperdocs and I was beyond amazed at the overwhelming possibilities of them! Ever since I have been on a mission to constantly work on my Hyperdoc game! At some point, I feel like we all get to the point where we feel that our Hyperdocs are missing that little something! 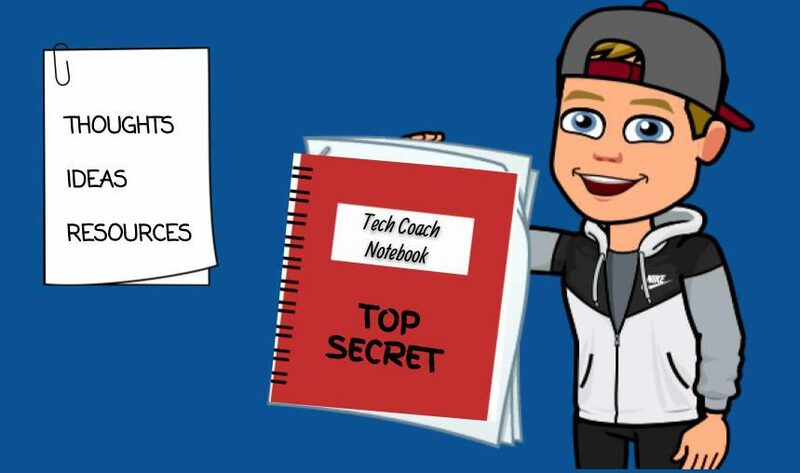 On this page, I hope to provide you with some strategies to help you take your Hyperdocs to the next level! Where do you want your HyperDocs to go? What might a student PERCEIVE or OBSERVE when using HyperDocs for learning? What might a student KNOW ABOUT or BELIEVE when using HyperDocs for learning? What might a student CARE ABOUT or VALUE when using HyperDocs for learning? Hours…Days…Weeks later…and the help from my great colleague and friend, Katie we came up with four shifts that all Hyperdocs need to make them student-driven! This is the first shift from teacher-centered → student-driven. By making this shift it allows us to hand over the keys and let students own their learning! Barbara Bray and Kathleen McClaskey’s framework for a Personalized Learning Environment (PLE) is a great place to get started design activities that give students voice and choice! The PLE framework is composed of three stages, each one gradually giving students more VOICE and CHOICE in their learning. Below I tried to “break it down” for you in a way that could be easily applied to a Hyperdoc. Provide opportunities for students to give feedback or demonstrate their background knowledge. One of my favorite activities is to create a collaborative slide deck with Google Slides. Students could demonstrate their learning on their slide and effectively give feedback to their peers on another. All the learning takes place in one area! Check out the “Caption This! activity from Laura Steinbrink and Matt Miller. You could easily include this as an opening activity or reflecting at the end of your Hyperdoc. Personally, a collaborative side deck is a MUST HAVE for me in any Hyperdoc lesson! Provide students with learning options! Giving students a little choice does not have to be too hard, just give them a few ways to show what they know! An easy way to do this is by creating a simple choice board. The best resource I’ve seen for choice boards comes from Kasey Bell! Check out Kasey Bell’s blog on Interactive Learning Menus. Kasey’s Tic-Tac-Toe Choice board can be found on the link above. My favorite part about choice boards is that they can become your hyperdoc! A perfect tool for keeping information and activities all in one place! In stage one, students are given voice by demonstrating their BK while being to give feedback to their peers. In stage two, we can make our students’ voice a little louder by providing opportunities for them to collaborate virtually with others. A great activity that can be incorporated into a Hyperdoc is slides (again). Google Slides is the perfect way to get students collaborating! Try out this Google Slides: Jigsaw Activity Template from Alice Keeler. Make a copy of this template, attach it to your Hyperdoc and you will have instant collaboration! absolute favorite activities comes from the book, Eduprotocols by Jon Corippo and Marlena Hebern. The book is filled with a bunch of protocols that really driven student choice and creativity. Try out Jon Corippo’s Iron Chef EduProtocol template! I would definitely consider this book for more ideas as well! Not only do we want our students to share their voice within their own classroom, but we ultimately want them to share learning beyond the walls of the classroom! Embedding tools such as Flipgrid or Padlet in your lessons can open up your classroom to another world! By doing so, we amplify student voice to the next level! 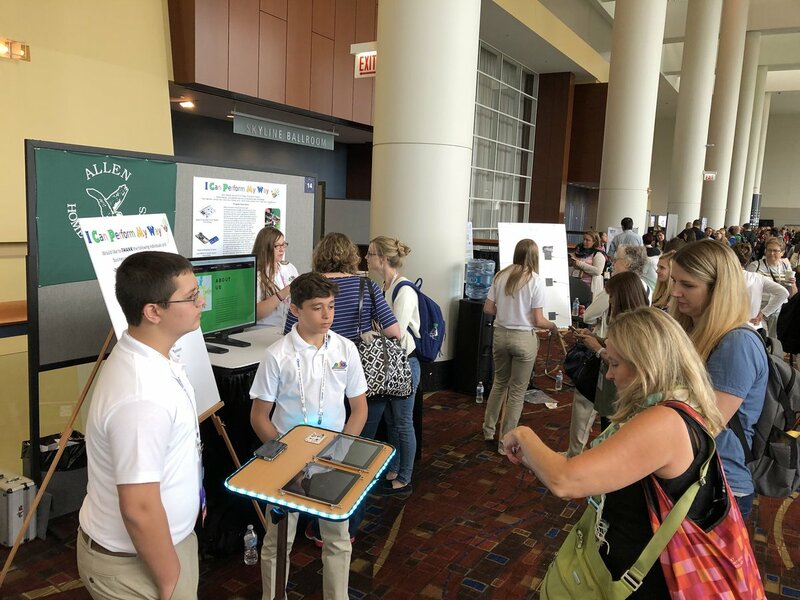 In my recent #ISTE18 session, I modeled Fligrid with teachers. To me, it’s THE TOOL for voice in the classroom. Now that it is free, take advantage of the possibilities! Check out the grid from my session on how teachers are trying to take their hyperdocs to the next level! Check out the grid here! Use the password: HyperDocsISTE to get in. Feel free to add your own response to the grid! In the previous stages, students were given options to choose their learning destination with choice boards and show off their learning with an open slate. In stage three, we can really take our hyperdocs to the next level by giving students opportunities to become problem finders and solvers. A great way to do this comes from an under the radar tool created by Dee Lanier. His SmashboardEdu template is an AWESOME way to get students to show off their creativity, find problems, and come up with innovative solutions in a gamified way! Today’s culture of education can bring upon many stresses to both teachers and students. Standardized tests and the evaluations that go along with them can easily become the monster under your bed if you dwell on them on a weekly basis. Reflecting on my own years of teaching, I realized that the standardization that came along with teaching drove me to fear teacher. Afraid to make mistakes, afraid to “waste instructional time” or lose control of the classroom. Benchmark tests would haunt my dreams as words like “growth” and “bubble kids” would drive me to insomnia. In my first few years, I feared that my principal would mark me as “needs improvement” if I wasn’t following a structured lesson plan or if a student talked out of turn. Lesson plans became scripted, almost robotic, regurgitated because I was afraid. Over the last two years, I finally faced my fears in adopting student-driven learning practices. Students were no longer sitting in rows facing the classroom, but in groups facing each other. I ditched the basal and picked up REAL literature. Students would discuss and share their thinking. We would come up with our own questions, and I would model my own thinking and learning. I am not writing this post to discuss student-driven learning versus the traditional model of teaching, but I do want to bring light the importance of teaching without fear. In order to teach without fear, you must step outside of your comfort zone. A good way to start would to put the teacher’s edition to the side and the student text books on the shelf. While I think these are valuable sources for establishing a scope and sequence, we should not rely on our textbooks as the main source of information. We live in the 21st century. Your students can easily google the information they need. Students need opportunities to make learning personal by making connections to the lesson’s content. Using protocols or visible thinking routines could be used to structure the lesson without scripting it. Let students ask the questions and make discoveries on their own. Teach without fear by giving students some say in the learning. Who Determines the Destination in Your Classroom? the destination or was I? After about 15 seconds of thinking, it was clear to me that I was missing a few pieces. Regardless of who is driving, lessons revolve around learning goals. Generally, as a teacher I would browse my lengthy curriculum map to decide the destination for my students. After that, I would spend several hours designing lessons that were meant to be engaging and purposeful. In every lesson we would go over “our” learning goals, which really were my learning goals, more specifically Indiana’s learning goals. Looking back at the previous school year, I am quickly beginning to realize how little say my students had in determining learning goals. You’re probably thinking, “Brett is trying to get me to ditch my standards and forget the test!” No…not saying that. Is there a way we can have the best of both worlds? Can we have students determine the destination while staying on the road of curriculum? I’d like to think so! I will be going into this topic further into the future, but I’d love to hear your thoughts on this format of student-driven learning. Hi! My name is Brett, and I am an innovative learning specialist for Five-Star Technology. I work at South Ripley School Corporation as an e-learning coach. I am beyond excited to start a blog and share my thoughts and ideas related to education. I am a technology nerd, and love to use tech to make AWESOME learning experiences for kids!